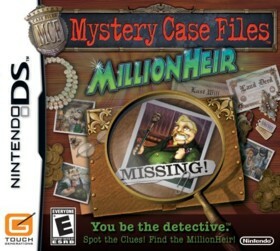 Mystery Case Files: MillionHeir is a Nintendo DS game in the Puzzle genre. The game was published by Nintendo and developed by Big Fish Games. The game has an ESRB Rating of E (Everyone 6+) and was released on 2008-09-08. The game's official site can be found at www.nintendo.com/mcf. This is the first BIG Fish title for the DS and boy did they hit it out of the park. It features touch screen gameplay similar to a wheres waldo game, but also mixes in puzzle sequences to add some variety. The game is very fun and will last at least 10 hours before you complete the story. The best part is you can play again on higher difficulties or even play some multiplayer with 2 DS's.